WOULD YOU LIKE YOUR WORK TO BE SEEN AROUND THE WORLD? Over the past 25 years, Naturewatch Foundation has developed a wide range of sustainable animal welfare projects in several countries both in the UK and throughout the world. Our campaigns include coordinating World Animal Day, which takes place on October 4 every year. This global movement aims to raise the status of animals and has over 90 active Ambassadors working around the world. Throughout the year, we promote World Animal Day via various methods, primarily using social media. We are looking for a reliable GRAPHIC DESIGNER to help us prepare images suitable for social media. Initially, the role will relate to World Animal Day and will include adapting existing graphics to each language – translations will be provided. In the future, there will also be an opportunity to create original graphics. Adapt a series of three existing graphics to various languages, for which text and specific photographs will be provided. 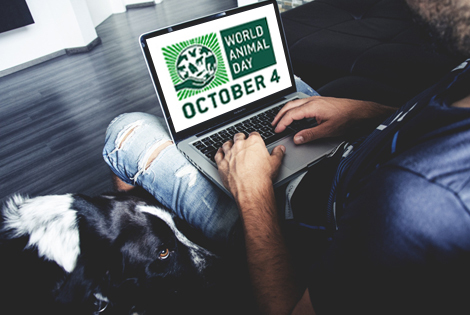 Create original graphics that adhere to World Animal Day branding guidelines. You will either follow a given brief or, in the future, may create graphics based on your own research. All original graphics will be subject to approval by World Animal Day. Liaise promptly with World Animal Day regarding any issues or queries that might occur. There may also be an opportunity to create leaflets and other promotional materials in the future. After October 2018 and following successful completion of the above project, there may also be an opportunity to work on other Naturewatch Foundation campaigns, such as badger baiting, puppy farming and animals experiments. A Graphic Design qualification is NOT required. Therefore, this voluntary position may be suitable for a student to gain experience. Experience using Adobe Photoshop is essential. Indesign skills would be beneficial. Naturewatch Foundation is based in the UK. However, applications from overseas designers are also encouraged. Fluent English is essential. be part of a growing phenomenon in animal welfare. World Animal Day has trended on social media for the past two years. If you’re available, you could participate in keeping #WorldAnimalDay buoyant on October 4 – wherever you are in the world! gain experience in adapting existing images and creating original graphics. include original creations in your portfolio. receive a written reference for future projects following a successful working relationship with Naturewatch Foundation and World Animal Day. Please send your CV/resumé and examples of your work (voluntary or paid) to info@naturewatch.org, letting us know how much time you would be able to allocate to the project until October 2018. Due to the scale of the project, this role may be shared between several designers.